Tie-rod mount limit switches that are adjustable throughout the cylinder stroke length are commonly available on pneumatic cylinders. We also offer this on our pressure rated hydraulic cylinders! This is possible because the tube material in this JHDH series is not steel. Never has been. For 60 years we have built our pneumatic and pressure rated hydraulic cylinders with tubes made of tempered brass. This material enables us to feature the same magnetic piston sensing option in hydraulics that is common in pneumatics. 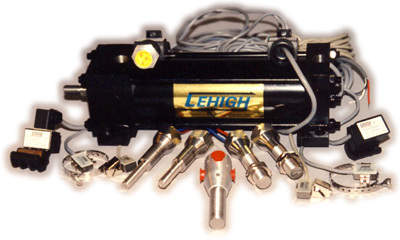 Lehigh has the capability to offer tie rod mounted limit switches on high pressure hydraulic cylinders and and LSSW stainless series cylinders. The advantage of tie rod mounted switches is the ability to sense piston position anywhere along the stroke. In the past, end-of-stroke piston sensing was the only option available. The switch senses a magnet in a groove on the piston through the tube wall. The cylinder tube and piston must be made of non-ferrous material.The switch offered is the Balluff BMF 21. This switch and its mounting bracket are made specifically for tie rod cylinders. The switch is available in PNP or NPN normally-open, 10-30 VDC. This new switch option is available for cylinder bores 1 1/2” through 4”. The switches can be used with any standard catalog NFPA mounting option.